Is Panama Responsible for the Panama Papers? Juan Carlos Varela, President of the Republic of Panama, lamented the fact that the Panama Papers scandal has tarnished his country’s image during his speech at the opening ceremony of the 17th International Anti-Corruption Conference. But Varela also said that Panama is not the one to be blamed for that, as the whole world is involved in illicit financial flows. The investigation has shed light on the companies based in or connected to the country, that have served as gateways for diverse suspected activities that ranged from presidents trying to hide corruption money to football players that were avoiding taxes. Read more about the investigations. But who is really responsible for that? Is this just a Panamanian problem, or is it a global one? 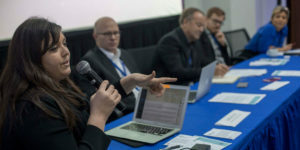 We spoke with the participants of the 17IACC panel Overcoming the Shadow Economy to understand who should take responsibility for those issues, and whether the President’s contention has merit. All of the participants said that financial secrecy is a worldwide problem, and it goes well beyond tax havens. But they also agreed that countries such as Panama should take full responsibility for the problems found in the companies ostensibly based within their borders. “The standard response [of tax havens] is to point the finger at someone else”, said Nicholas Shaxson, author of the book Treasure Islands and a member of Tax Justice Network. Shaxson made an analogy between the use of tax havens and a driver that is used to take a criminal away from the scene of a crime. “Usually the actual criminal is somewhere else, but the tax havens are the gateway for our drives. And when the police is going after the criminal, they have to go after them [the drivers]”, said Shaxson. Mark Pieth, former member of the Independent Committee to revise the practices of the legal and financial industry in Panama, said that the “Panamanian share of the problem is that they have been hosts and cooperators to those firms.” According to him, the President is changing his posture little by little. “I am quite happy that the Panamanian president is now saying ‘that is not just us’, because at the beginning his discourse was ‘that it is not us,’” said Pieth. One of the journalists who broke the Panama Papers story, Frederik Obermaier of the Süddeutsche Zeitung, said that politicians from Panama are still upset about the eponymous name used to refer to the investigation. “If that is your only problem with the Panama Papers, then there is something wrong, because the papers showed to such a huge extent for what they were useful,” he said, exemplifying that those firms were used to hide criminal activities in other places. Even so, the conclusion of all of the experts is that small tax havens, such as Panama, are not the only ones at fault. “Some of the great countries in the world are also tax havens, including the United States and the United Kingdom. So responsibility is everywhere,” says Shaxson. Piero Locatelli is a journalist at Repórter Brasil. He investigates the supply chain of companies and its relation to human rights issues. He has been covering politics since 2008 and has worked in Brazilian news outlets such as CartaCapital, iG and UOL. He is the author of the book #VemPraRua, about the Brazilian protests of 2013.